[W]e at the Center are acutely aware that our society is far from the days when nary a female could be found in the film director’s seat, when women journalists were relegated to the women’s pages, when a woman was hard-pressed to get an entertain- ment media project green-lighted. Today’s sure-enough strides show Shonda Rhimes breaking barriers in primetime TV; Jill Abramson helming the globally influential The New York Times, our national paper-of-record; and a small assortment of females-in- chief looming large in the digital sphere. 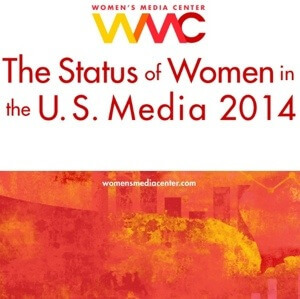 Yet, as we compiled the findings in this third annual report and conferred with watchdogs and researchers who analyze newsrooms, film lots, broadcast studios, the digital sphere and more, we couldn’t avoid reaching the same concerning conclusion: The American media have exceedingly more distance to travel on the road to gender-blind parity. These trenchant data from a host of university scholars, private entities and media organizations themselves—and the true stories of women whose career trajectories these data help gauge—reflect an array of ongoing obstacles. They suggest a trou- bling status quo and, in some places, a slipping back in time. The bleakest of realities show that those who steer sports news coverage remain over- whelmingly white and male, even as women’s sports and the ranks of sports fans who happen to be women are surging. Women of color in certain sectors of media—with their own singular urgency to help tell our myriad stories and help call the shots—are among those who have lost ground in recent years. They are being spotlighted in this yearly report for the first time. It matters that women of color and every one else in this diverse nation be part of the conversations conducted through the media. Unequivocally, it matters when all Ameri- can women—51 percent of the U.S. population—get our just due across the vast media landscape. Only when women are equal partners in the multi-layered work of deciding what constitutes a story and how that story might be told can we paint a more textured, accurate picture of the worlds that we all—male and female—inhabit. —The Women’s Media Center. 20 Feb 2014 in Business, Culture, Journalism, Media.